For the first time in my blogging career, I have been tagged. I know. I'm excited about it. For what, you ask? 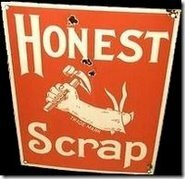 Well, for the Honest Scrap Award. By whom, you ask? By the lovely Belen of this fun blog, whom I mentioned before in this post. Apparently, I am to post ten honest things about myself. I have decided to use the same questions that Belen used. Running in 53 degree weather on a Saturday morning when the whole world is still quiet and foggy and covered in dew. Showering afterwards and going to the mall with my mom because I have no homework. Arriving home having found a bunch of great sales. Eating dinner with the whole fam. Hopping back into the car to drive to Brooke's house to have a sleepover with all my girls, both those from home and those from school. Brownies included. Is it bad if I say my MacBook? Because...probably my MacBook. I like my glasses a lot, too. Not that I have to wear them, just how much nicer they are than my old ones. 3. If you had to describe yourself in one word, what would it be? Passionate. I know that word has some weird connotations, but it literally means "having, compelled by, or ruled by intense emotion or strong feeling." I would LOVE to be able to sing. Like this one here. 6. What is your biggest regret? Getting hurt? I don't know. I don't know who I'd be if I hadn't gotten hurt. I just love lots of things. See number 3. 8. What is the trait you most deplore in yourself? My perfectionism, but I'm working on it. I read the other day that Ann Wilson Schaef once said that "Perfectionism is self-abuse of the highest order." I have no idea who Ann Wilson Schaef is, but I agree with her. 9. What would you be doing right now, if nothing could stop you? Running. Have we established that already? 10. What do you value most in your friends? I will be tagging some of you crazy kiddos tomorrow to fill this out yourselves, but now I need to go to bed because it's late and I'm giving a persuasive speech tomorrow at 9:25! DUMB.